2016 has been a milestone season for Bernhard Langer. He has reached 40 years on tour and a century of professional wins and the winning is probably not finished yet. Oh, and it has been 25 years since he missed that putt at Kiawah Island in the Ryder Cup, but he’s over that now, honestly. The German legend spoke to Robin Barwick. Whenever there is euphoria for one in sport, there is desolation for another. It’s how it works, like Jin and Jang, like the Ryder Cup. One of golf’s most vivid images shows the moment Bernhard Langer lost the Ryder Cup. Kiawah Island, South Carolina, September 29, 1991. The German golfer, aged 34 at the time and in the prime of his distinguished career, missed a six-foot putt on the final green to half his decisive singles match against Hale Irwin, the three-time U.S. Open champ. 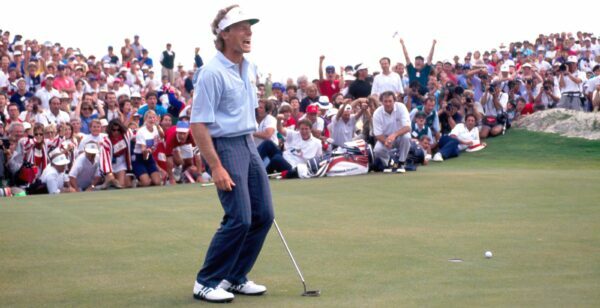 The ball slipped past the hole, Langer’s knees buckled and he yelled, the agony etched across his face as the surrounding landscape melted around him into a bubbling sea of American celebrations. The half point was all the hosts needed to secure victory by the narrowest margin, 14 ½ – 13 ½. It was the first time the United States had won the Ryder Cup since 1983—an eight-year drought after the United States had never previously lost consecutive Ryder Cups. So 1991 was particularly emotional and it was dubbed the “War on the Shore” after tempers and patriotism spilled over. There is so much to see in this iconic picture [on previous pages]—captured brilliantly by the late Phil Sheldon—like the figure of Irwin at the back of the green, rising to his feet and showing his sportsmanship by resisting the temptation to lead the raucous celebrations despite bringing home that last half-point. Instead—and for the record—he walked over to Langer, offered his commiserations and the two players hugged. Irwin and Langer: major winners, steely competitors, Ryder Cup rivals and they have since become two of the finest golfers ever to grace the PGA Tour Champions. They have also become firm friends. Langer responded to the disappointment the way the greatest champions do; he returned home and straight away won the German Masters on the European Tour the following weekend. American captain Hal Sutton stood proudly on stage at Oakland Hills in September 2004 during the opening ceremony to the Ryder Cup. Wearing a dark pinstriped suit and gold tie around his thick wrestler’s neck, Sutton boldly announced that the lead-off American pair the following morning would be world number one at the time, Tiger Woods, and world number two Phil Mickelson; the two most exquisite talents in American golf. Sutton said the pair would be “as strong as old rope”. Sutton believed that in the heat of the Ryder Cup, arch rivals Woods and Mickelson—who could not stand the sight of one another—would form an indestructible bond. “We had heard a rumor that Woods and Mickelson might play together and we were ready,” says Langer, who was Sutton’s opposing captain that week. The Woods-Mickelson axis was one of the biggest gambles of the modern Ryder Cup era and it flopped miserably. The pair lost the opening fourball match to Colin Montgomerie and Padraig Harrington, 2&1, which set the tone for the rest of the weekend. A humiliated Sutton went double-or-quits, pitting his dented dream duo against Darren Clarke and Lee Westwood in the Friday afternoon foursomes. All square on the 18th tee, it was ironic that Mickelson wildly sliced his critical drive, having previously commented publicly that Woods was holding himself back by playing with inferior Nike equipment. Woods was left with a drop from an unplayable lie, they lost the point and finished 0-2 for the day. In contrast to Sutton’s reckless pairing, Langer treated his captaincy as he had his entire playing career; with meticulous care. He even sent out his players for extra autograph signing duties to defuse any hints of the toxic atmospheres that soured the Ryder Cups at Kiawah and again at Brookline in 1999. The visitors spent more time with the home fans than the home team and the plan worked. “The Ryder Cup is one of my favorite events, maybe even my favorite of them all,” says Langer, with the memories of famous success far out-weighing the disappointments. “It is always thrilling to see the matches and all the emotions on the faces of the players, the caddies and the captains, and even the spectators. It is just a different kind of tournament, being in teams and match play, and it is great to have that in our sport. It is not often we just play for honor. Now the player to beat on the PGA Tour Champions, Langer comfortably leads the 2016 Charles Schwab Cup points list for the over-50s circuit at the time of writing, having won four times this year—including a pair of senior major titles—which takes his roll of professional tournament victories to a total of 102. Twice the Masters champion—in 1985 and 1993—Langer played on 10 European Ryder Cup teams from 1981 to 2002 (Nick Faldo is the only European golfer to have played in more; 11) and he was a member of Europe’s “Big five” of the 1980s and ‘90s—along with Faldo, Seve Ballesteros, Sandy Lyle and Ian Woosnam—who were integral in turning the Ryder Cup tide away from the once omnipotent Americans. While Langer will be undoubtedly hooked to the Ryder Cup at Hazeltine, his more pressing priority is to claim the Charles Schwab Cup, the senior equivalent of the PGA Tour’s over-arching, season-culminating FedExCup. Langer has completed seven out of the last eight PGA Tour Champions seasons as its leading earner of prize money, converting three of those seasons to Charles Schwab Cup success too. Since claiming the Boeing Classic in August Langer is tied with Lee Trevino on 29 wins on the over-50s tour, second place all time behind Irwin. Now 61, Irwin has accumulated 45 PGA Tour Champions wins; a record that remains insurmountable for the foreseeable future. Another seniors record within Langer’s reach is Jack Nicklaus’s all-time leading mark of eight senior major titles. Langer is on seven—tied with Irwin—having claimed the Regions Tradition and Constellation Seniors Players Championship this year. And if Langer can claim the 78th KitchenAid Senior PGA Championship at Trump National Golf Club in Washington D.C. in 2017 he will become the first golfer to complete the senior slam of all five major titles. “These milestones are a by-product of always trying to get better and working on my game,” says Langer. “I always do the best I can. It is amazing that only Jack Nicklaus has won one more senior major than Hale and I. I could catch Jack and maybe even surpass him. Like he did as captain in 2004, Langer keeps his cards close to his chest in considering the prospects for the 2016 Ryder Cup at Hazeltine, when Clarke and Davis Love—friends who halved a singles match at Oakland Hills in 2004—lead out their respective teams. The stakes are particularly high this year, as if Europe wins it will do so for the fourth straight Ryder Cup, something that has never happened in 99 years of Ryder Cup competition. “The Americans will be playing at home, in front of a home crowd, but all of that does not matter,” says Langer. “The key is for your players to be in form and it just depends who makes the putts and who plays the best over the three days.